We want to bring you a great experience across all Google products which, for Gmail and Contacts, means understanding what you care about and delivering it instantly. With that in mind, we’re introducing some new integrations with Google+ that we think will make Gmail and Contacts even better. If you use Google+, you can now grow your circles, filter emails and contacts by circles, keep all your contact information up-to-date automatically and share photos to Google+, all right from Gmail and Contacts. Now when you open an email from someone on Google+, you can see the most recent post they’ve shared with you on the right-hand side of the conversation. 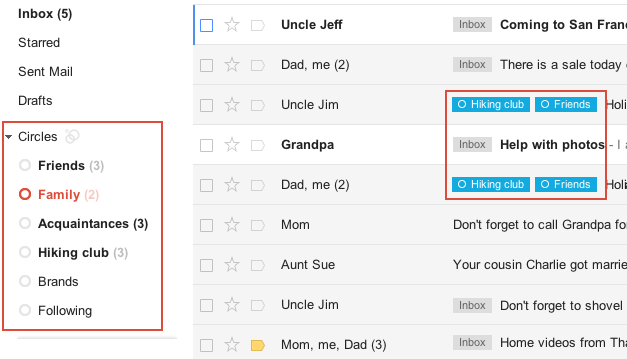 If they’re not in your circles yet, it’s easy to add them straight from Gmail. Looking for the info on an upcoming family holiday gathering but can't remember who sent it? If you've spent time building your Google+ circles, you can now quickly use them to filter your mail, saving yourself from having to sift through that pile of daily deal emails and newsletters. You can see messages from all of your circles at once or from each individual circle. 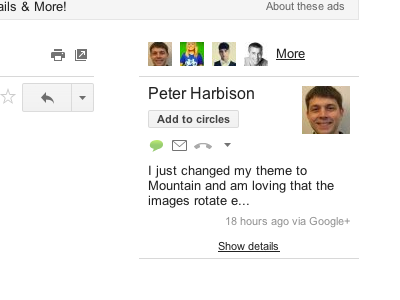 And if you want, you can show circle names on emails in your inbox. Contacts can also be filtered by circles, making it easier to view your social connections. Manually entering contact information can be a huge time drain—so let your circles do it for you. 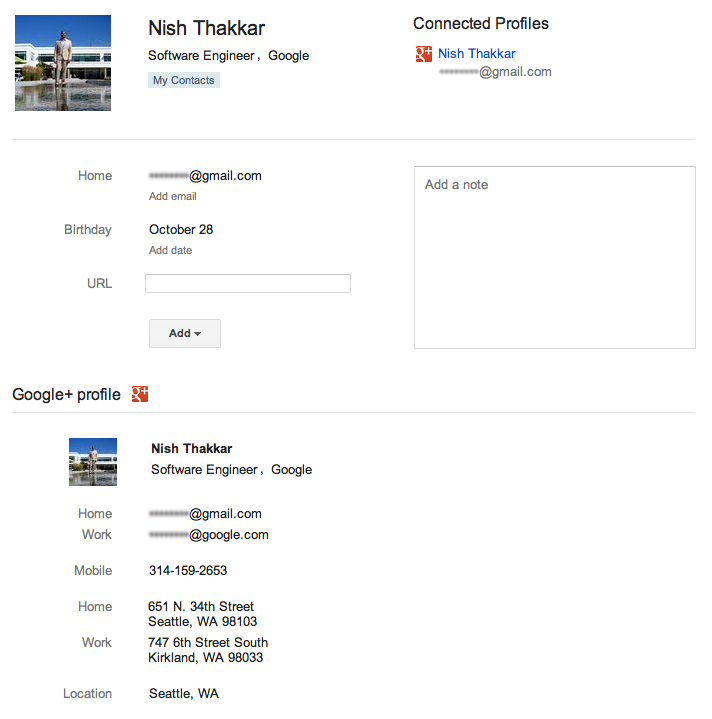 If your contacts have a Google profile, their contact entry in Gmail will be updated with the profile information they’ve shared with you, including phone numbers, email addresses and more. If they change it in the future, you’ll get those updates automatically. You can also make sure the people you care about have your most up-to-date contact information by updating your own Google profile and sharing it. Lots of great images are sent through email, but sharing those photos with friends on Google+ used to require downloading the image from Gmail and re-uploading to your profile. Not anymore: Now you can share photo attachments with one quick click. 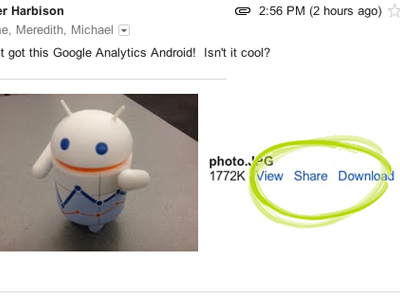 The image(s) will be uploaded to your Google+ photos and be viewable only to the circles that you choose to share with. We’ll be rolling out all of these changes out over the next few days to Gmail, Gmail Contacts and the “standalone” version of Google Contacts at contacts.google.com. Please note that Google Apps users won’t see the Contacts updates quite yet, but we’re actively working to make them available. All of these features (and the more to come) are the result of the great discussion that we had on Google+ with users in July. If you want to join in discussions like these, add the Gmail Google+ page to your circles. And if you haven't signed up for Google+ and would like to try these new features, visit this page to get started.